Synopsis (from the publisher): John Wells may have left the CIA, but it hasn't left him. A mysterious call brings a surprise meeting with the aged monarch of Saudi Arabia, King Abdullah. "My kingdom is on a precipice," he tells Wells. "Powerful factions are plotting against me, and my own family is in danger. I don't know who I can trust, but I'm told I can trust you." 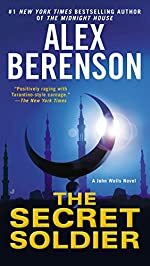 Reluctantly, and with the secret blessing of the CIA, Wells goes undercover; but the more he learns, the more complicated things become, and soon he, too, is unsure whom to trust, in Saudi Arabia or Washington. One thing, however, is clear: If the conspirators prevail, it will mean more than the fall of a monarch — it may be the beginning of the final conflagration between America and Islam.